On the 7th December 1942, the Medical Superintendent of Rydalmere Hospital in Sydney NSW, Dr. Sylvester. Minogue, wrote to The Editor of the American Journal of Psychiatry in the USA. He had read an article in the Journal by Dr Harry Tiebout, a prominent psychiatrist and the first of his kind to embrace Alcoholics Anonymous as a successful treatment of alcoholism. The letter was passed on to the Alcoholic Foundation as the office was then known. It was date stamped 26th January – a significant date for Australia – Australia Day 1943. In 1954, the Foundation became known as the General Service Board. The letter was requesting further information regarding the formation of a ‘Branch of Alcoholics Anonymous in NSW” This expression of interest was passed on to the office Secretary of the fledgling movement Alcoholics Anonymous, which then numbered some 8000 members. The Secretary of the AA Central Office in New York Margaret (Bobby) Berger wrote back to Dr. Minogue, and included in the reply was the promise to send a complimentary copy of the book Alcoholics Anonymous. So the first “Big Book” as it is now affectionately known, arrived on Australia’s shores free of charge as it was a gift. Being wartime, US dollars were needed to purchase anything in the US. These books were not classed as medical books so the government would not supply AA with the necessary dollars. On the 17th March 1943 Dr. Minogue contacted the office again in the USA stating that the Book Alcoholics Anonymous had arrived and was proving to be a mine of information for him. He commented also on the fact that after some 20 years of treating alcoholics in this country, there was only a small percentage of recoveries, and a great proportion of failures.” He also made the observation that” Acute alcoholics recover rapidly in hospital, and relapse just as rapidly on their discharge! !” He also observed that alcoholics had their feet firmly planted in midair. Over the years Dr Minogue tried to get a meeting going without success. Later he got together with Father Thomas Dunlea who was the founder of Boy’s town in Australia. Father Dunlea had also tried to get a meeting going around the Sutherland area. There were some meetings going before the one that started in 1945 which is recognised as the beginning of AA in Australia. But these meetings never caught on at that time because there were too many hangers on who wanted to exploit Alcoholics Anonymous. The meetings were shut down one way or the other. Eventually in 1944 Archie McKinnon, a psychiatric working at the old Reception house at Darlinghurst read the same article as Dr Minogue in the American Journal of Psychiatry and found out that Dr Minogue and Father Dunlea were already trying with the help of the Big Book to get some alcoholics sober. Archie contacted them and they combined forces. He invited Dr Minogue and the late Father Tom Dunlea to join him in helping to bring about a better way of life to the suffering alcoholic. They had a little group which met at Dr Minogue’s residence at the Rydalmere Hospital. It was only held there for about a month and was then moved, as this venue was inconvenient to travel at night and they were able to acquire another venue in the city. This first Group was a mix of both non-alcoholic and alcoholic members. Father Dunlea had tried to help the down and out alcoholics at Sutherland by means of preaching, concerts, gifts of money, and clothing. These were the ways in which he tried to get through to the unfortunates who huddled in the camps where the food was scarce, but some good alcohol was available so they would not drink metho or cheap wine. The result was a dismal failure. This was before the Twelve Traditions were written in the AA Grapevine in 1946. They were accepted by the fellowship at the first International Convention in Cleveland 1950. There were very few books available in this country in those earlier days which was a major problem in transmitting the message of our Fellowship; this then had to be done by word of mouth. Then came the first brochure entitled “The Basic Principles of AA” which was put together by those early pioneers and was described as an instructive little booklet. A Radio broadcaster, Frank Sturge Hardy was approached by Archie and one of the early members, Jack, to give the Fellowship some needed exposure. Sturge, as he was known in AA, was surprised to know there was a group in Sydney, as he had been broadcasting about AA since 1944 from 2GB on his program “Let’s talk it over”, and did so at every opportunity. Sturge was a great speaker and did so at AA meetings for the next thirty years. He had been an Anglican priest, was known as a very spiritual man and helped the early members to interpret the Twelve Steps. Jack was never comfortable with the spirituality of the program and eventually started a breakaway group. He emasculated the steps and removed any reference to the spiritual. He called it the “Common Sense” Group. He was a good speaker and several members followed him out. It only lasted about a month and folded up. They all came back sheepishly except Jack. Unfortunately he later died from and overdose of paraldehyde. The Big Book and the Basic Principles of AA were all the literature they had at the time to get the knowledge of the program. Father Richard Murphy came on the scene late in 1945. Dr Minogue, Father Dunlea and Archie McKinnon had different ideas how the program should be used and Father Murphy was very helpful in helping to smooth down the tension and helped them to see the best way to move forward… He played a similar role as that of Father Ed Dowling in the early days of AA in the US. In October 1946, Archie was then invited down to Melbourne to visit and advise the Brotherhood of St Laurence there to speak on his work with alcoholics. This was AA’s first move interstate and a Group was started by a clergyman of the St Laurence Order. In June 1947 Meredith, an alcoholic, and a wine merchant from Adelaide travelled to Sydney to learn about the AA way of life, he founded the first Group in Adelaide, in that same year the actress Lillian R. visited Australia and was very instrumental in giving AA a kick-start by speaking at Public Meetings wherever she and her husband Bert M. went. Jim from Western Australia, also travelled to Sydney, he returned home to form the first Group there. In Queensland, a group was started in Brisbane by Dan.C, and in 1949, a group was started in Hobart Tasmania, the inaugural meeting in Darwin was held in 1955 (As a matter of interest regarding AA worldwide, Father Tom Dunlea, on a visit to Ireland in 1946 spoke so much about AA in Dublin that it started a chain of inquiries which resulted in a group being formed in that city – the first one in Europe. Our first Central Service Office opened in Sydney 1952. In 1954 it was proposed that the states come together for a national forum discussion, ideas from this forum which culminated in the First National Convention being held in Melbourne in 1959. It was at this Convention that a resolution was made to establish a federal body of AA. The resolution contained a proviso that it would not become effective until confirmed by the various states. 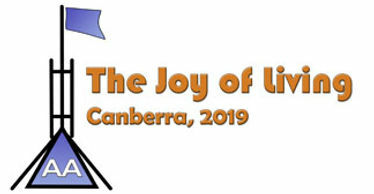 This confirmation was forthcoming, and it was decided to hold a second National Convention in Sydney in 1961; the first one held under the auspices of the Australian Service Conference of Alcoholics Anonymous. In the meantime, over a period of years, the General Service Board situated in New York, was encouraging the Australian Service Conference to establish a General Service Board, and following a recommendation from the 1972 Conference; a General Service Office was opened in Sydney the same year. When the office was opened a committee was formed to help with the overall working of the office and was called the General Service Committee. It acted like a board but it had no legal identity but handled all the functions between Conferences. There were many dedicated men and woman on this committee which met at the office monthly and in conjunction with the National Conventions. The members of this committee attended the Conference which was separated from the convention and met at a different time of the year. This was in place for a number of years and was finally voted by this committee that they no longer attended as the object was to have a two third majority of delegates. This had not yet been achieved but no doubt will come about sometime in the future. The name of this committee was renamed The Trustees Committee for General Services. It was in operation until the General Service Board was incorporated in 1979. The Board is operated by twelve Trustees, eight alcoholics and four non-alcoholics and includes the secretaries of the various committees. This Board continues to carries out the work of the General Service Conference between conferences. Two significant events in AA’s early days set the scene for the young Fellowships’ entrance into the field of Public Information. The first was when the Secretary to the first group Rex, became frustrated at the poor press reports outlining what AA really meant. “He wrote a lengthy reasoned and authentic account of AA” and submitted it to the Sydney Morning Herald. The ‘Herald’ accepted the article, and printed it in its entirety. The second came when Frank Sturge Harty, a well known Sydney radio personality and non-alcoholic, was asked if he could help carry the message of AA via radio 2GB, he was only too pleased to help. To this day, many AA members labour in the field of friends who include journalists, writers, radio announcers etc. protected by our Tradition of Anonymity at the level of Press, Radio and Films, we can continue to transmit AA’s message of hope. Our break into Treatment and Correctional fields is likewise documented. During those early days an invitation was extended to a Long Bay Gaol Officer to attend some meetings, and quite good results were achieved. After release, a few previous inmates began turning up for meetings. A meeting began in Callan Park Mental Asylum 1956. It was a daunting place for members there in those days as the windows still had bars on them and they had big iron doors which were slammed shut after the AA members were admitted. Not all of the patients at these meeting were alcoholics. Some of them were insane suffering from other mental illnesses. The members were wary of what reactions some of these patients may exhibit. One of the early members, Vic from Kingsford, himself was certified as insane three times and came along to the meeting in the hospital and was a great example to these suffering alcoholics. Vic later became manager of Langton House which was a half way house for recovering alcoholics. Callan Park was renamed Rozelle Hospital. Mc Kinnon Unit was a detox which opened there and ran for many years. A plan was started so the alcoholic patients could detox without medication unless it was necessary to stop a patient having a seizure. The patients were under observation for twenty four hours. Dr Michael.C. a member of AA was the medical superintendent at Mc Kinnon Unit. Once again, radio stations regularly featured on-air references to AA. This valuable 12th Step work is still attracting new members. Today AA carries the message into most Australian prison facilities and rehabilitation units. The aim of International Service meetings is to carry the message to the suffering alcoholic. Australia first became officially involved in the International arena in 1969 when the first World Service Meeting was held. We have participated in each biannual meeting since. In 1980 ‘Zonal’ meetings were formed in Europe and South America, and met in alternate years to the WSM. The Asia/Oceania Service Meeting (AOSM) had its first meeting in Japan in 1995 but Australia did not attend due to financial constraints. We have been very active since and hosted the 3rd AOSM in Sydney in 1999. The AOSM Secretariat is currently located in Australia, with Delegates from around the AOSM Zone keen to further both sponsorship and communication ties with our neighbouring countries. Further information regarding both the AOSM and the WSM activities are published quarterly in the AOSM newsletter and in the quarterly editions of AA Around Australia. AOSM Directories of meetings and contacts together with the World Service Directory are available from our General Service Office in Sydney. The following paragraph, from the AA Grapevine 25th AA Anniversary edition, suggests that Australia was the first country outside of North America to embrace the AA program. In 2011, it is estimated that there are about 18,000 members in Australia. There are almost 2,000 regular meetings of Alcoholics Anonymous currently held throughout Australia.